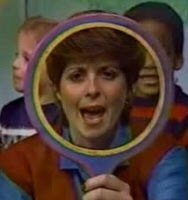 Fourth Grade Nothing: Romper Room Magic Mirror Never Saw Me! Yeah I never got a shout out on romper room or the magic garden. BTW...I heard Kelly Ripa didn't either. I just wanted those damn 'cup' stilt shoes, which apparently are called Romper Stompers. yes yes yes yes yes yes yes! I was never called. Yet my brother, Michael, was called all the time. It even made me cry. Omg, I had forgotten about Romper Room! I too used to sit there and wait patiently every damn day for my shout out but never got it! Not that Diane is an uncommon name but I was born in 1971 and seems all the other Diane's I'd ever met in my life were a good 15 to 20 years older than me (and long past the Romper Room days) so it wasn't a popular kids' name at the time. I don't think you ARE over it. LOL! I have doubts my name was ever called! Darn hard to find those little license plate thingies, too! Thanks to my mom naming me, Belle, I didn't have my name called out. I also never met another Belle until I was in my forties. Yeah, she never shouted out, "Teachinfourth" either. What's up with that? Had she called, "I see Caution!" I might have died on the spot. SO I guess her inattention to me was a good thing? I'm shocked about how many of my friends have no clue that this show existed - they've never heard of it! Can you believe that?! What the hell were they watching? We also had a Romper Room in Australia. Being the only Madeleine of my generation (well, at least the schools I went to), I never got that shout out either. If Romper Room were here today, it'd probably be a different story! she never saw my sister "claudia" either. I am 34 years old...for years I have been complaining she never said my name and I actually said it yesterday. I saw this post and guess what...I guess I missed that episode. Seriously made my night...my husband just thinks I'm silly! I am 34 years old...for years I complained that she never said my name. I watched the show religiously. I just thought of the show again yesterday after my mother in law told the dogs "Knock it off! This isn't Romper Room" I happened to find this blog and holy crap she said my name!!! I must have missed that episode! Seriously made my night! My husband thinks I'm silly!! I never heard of this show until today. I Was watching tv and when Leo DiCaprio was 3 he was cast for the show but never got to be in it because he was obnoxious.